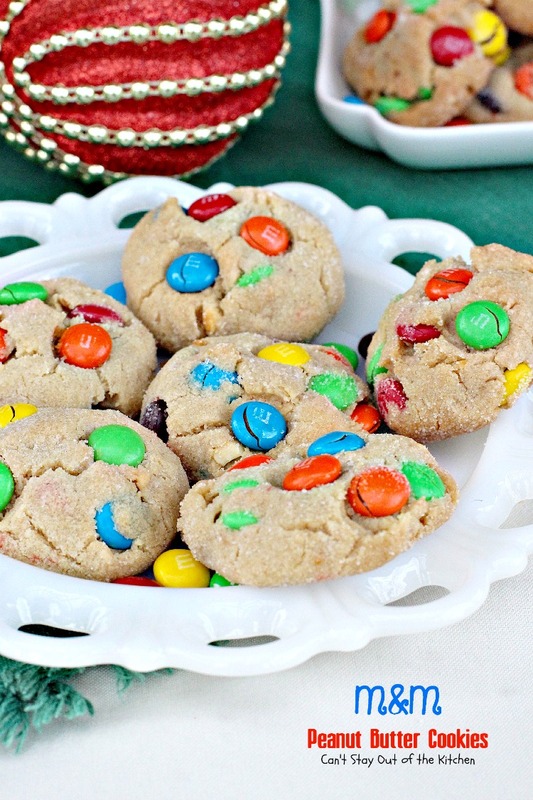 Prepare yourself for one scrumptious Christmas cookie. 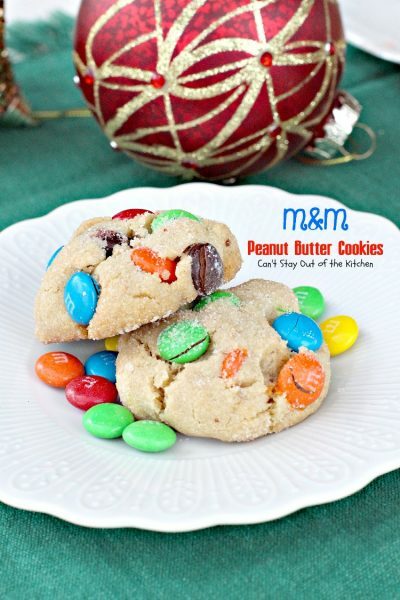 M&M Peanut Butter Cookies, oh my. 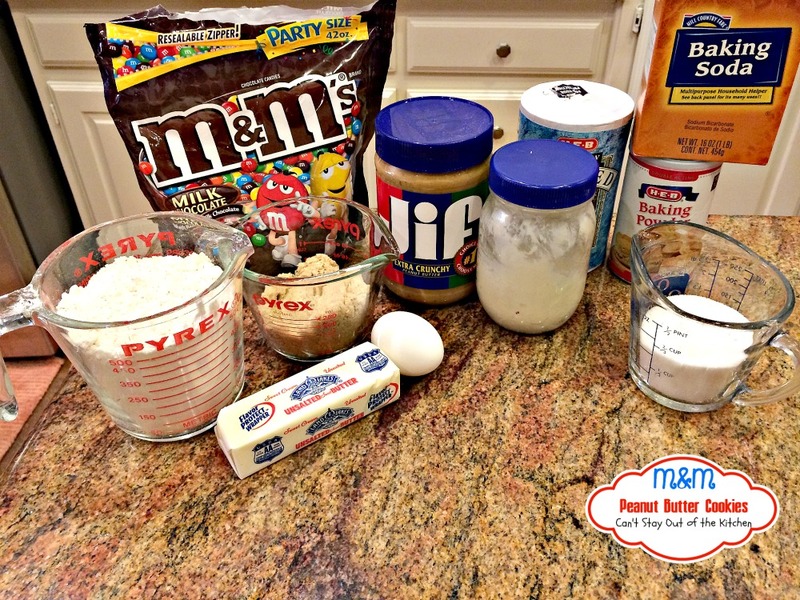 M&Ms, peanut butter, what’s not to love? If you love a good Peanut Butter Cookie, you’ll love it even more with M&M’s added to the batch. 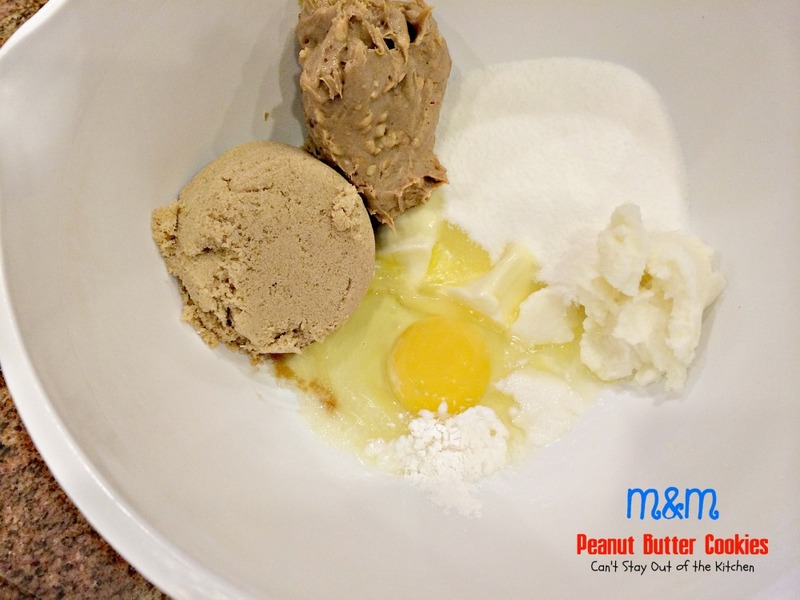 I followed my regular Peanut Butter Cookie recipe but used crunchy peanut butter instead. 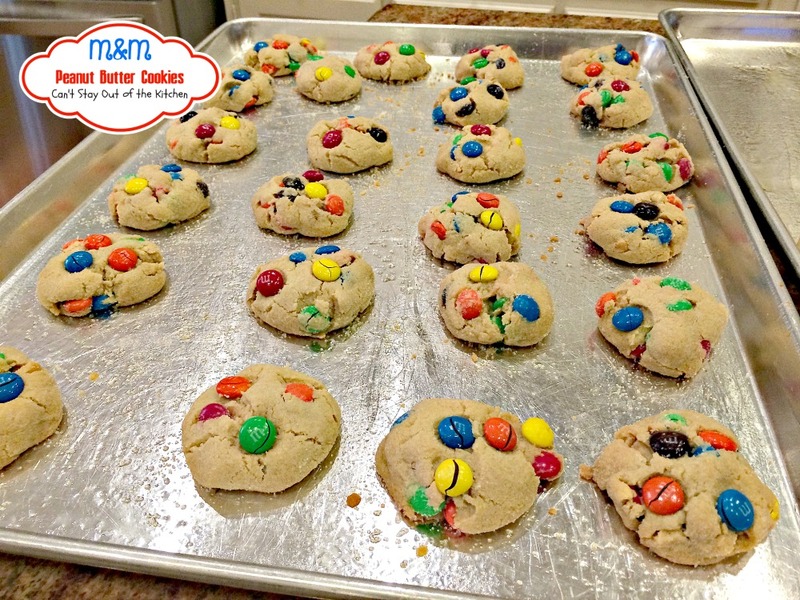 Every mouthful is so enjoyable you will be hard pressed to not sit down with a plate of cookies and eat ALL of them! After finishing our Christmas cookie baking this year I had a lot of leftover pantry ingredients that I wanted to use up. 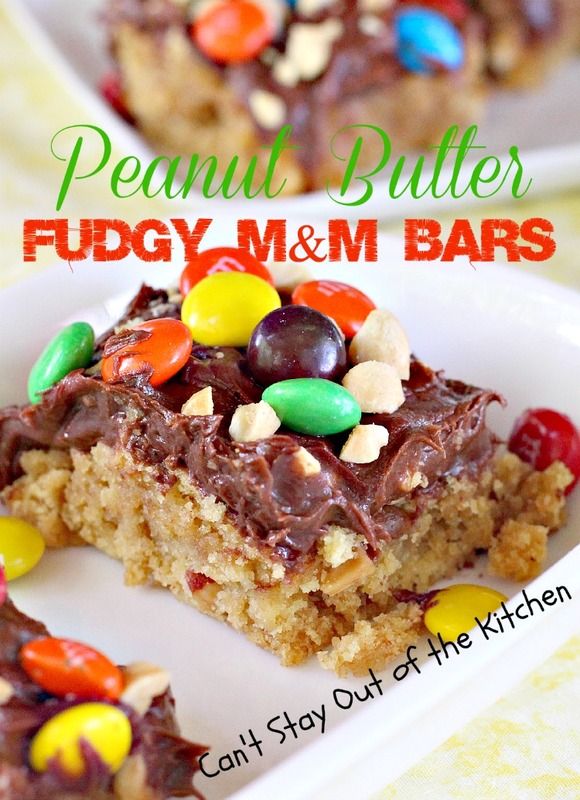 Extra crunchy peanut butter and M&M’s were two of the things on that list. So I decided to try to put them together and came up with this delightful recipe. We are constantly giving away cookies during the holiday season between Thanksgiving and New Year’s Day. These lovely cookies found their way into one of our care packages, although I set out a small plate for us which was gone very quickly. 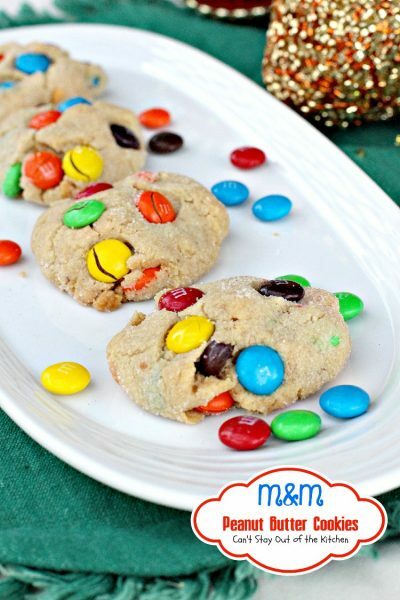 If you’re looking for a sensational M&M Cookie recipe, or a fabulous Peanut Butter Cookie recipe, then you’ve come to the right place. 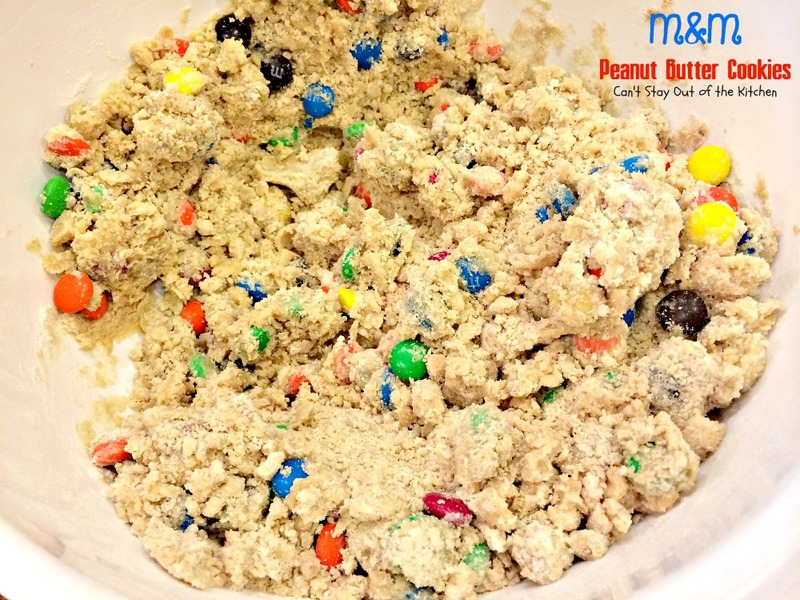 M&M Peanut Butter Cookies are the answer! 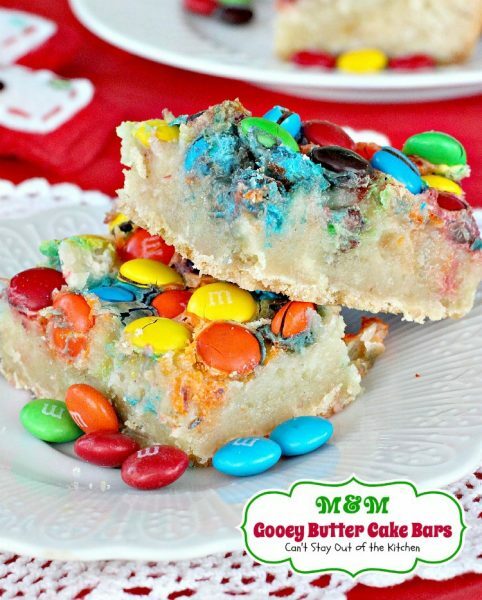 They’re great for holiday baking, tailgating parties, birthday celebrations or anytime you’re getting together with friends. 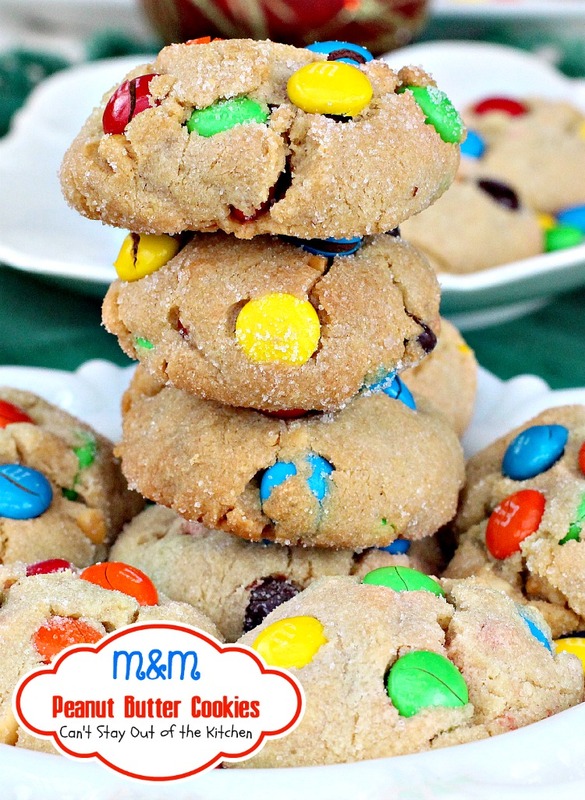 M&M Peanut Butter Cookies have the best of both worlds–crunchy peanut butter and M&M’s. Yum. 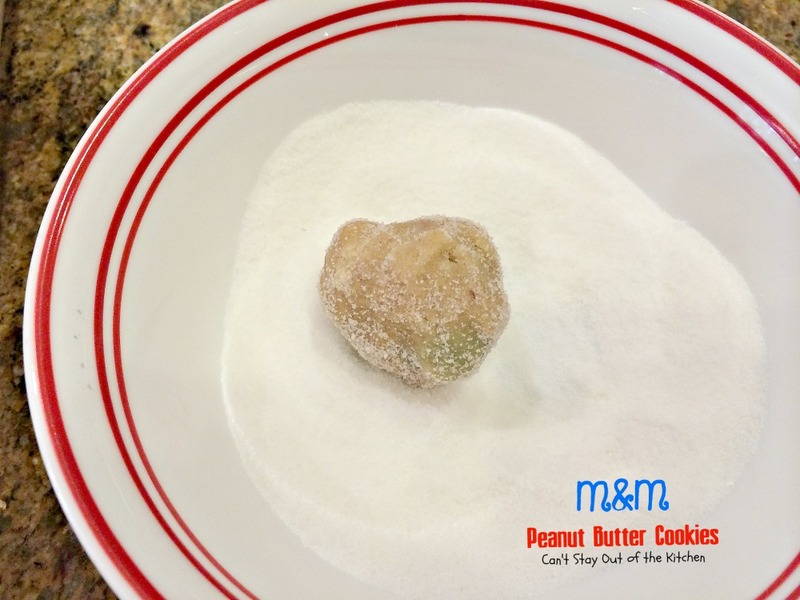 I love peanut butter cookies and these with a dose of chocolate are simply heavenly. Every bite of M&M Peanut Butter Cookies is so mouthwatering. I used these ingredients. Instead of using Crisco shortening I used coconut oil instead. The cookies turned out wonderfully well. Place softened butter, coconut oil, sugar, brown sugar, extra crunchy peanut butter, egg, salt, baking powder and baking soda in a mixing bowl. Add UNBLEACHED all-purpose flour. (Bleached flour toughens baked goods). Add M&M’s. Stir with a wooden spoon to combine. Chill dough at least one hour. Roll dough into balls. Roll each ball in granulated sugar. 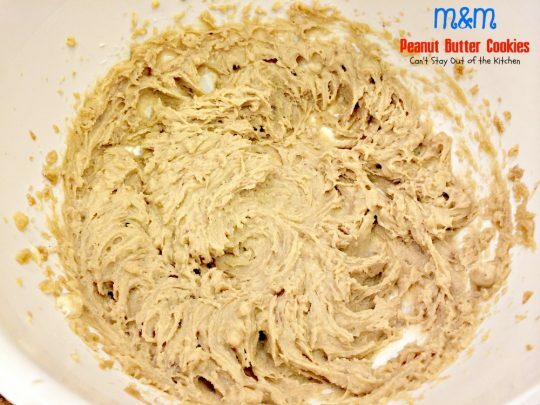 Place cookie dough on greased cookie sheets. Press M&M’s into the tops of each cookie. Bake cookies at 375 about 15-20 minutes until set but not hard. If you love M&M’s you’ll love these cookies. They’re great for holiday baking, too. 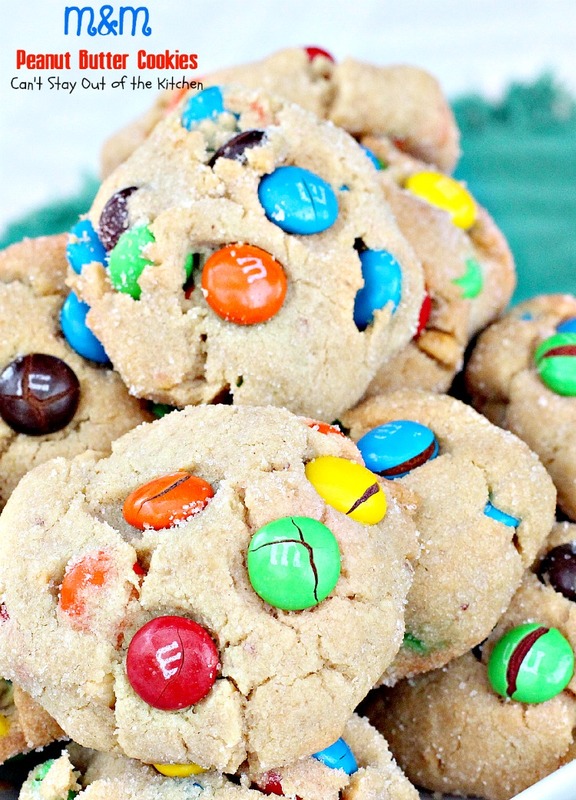 M&M Peanut Butter Cookies are great for tailgating parties. 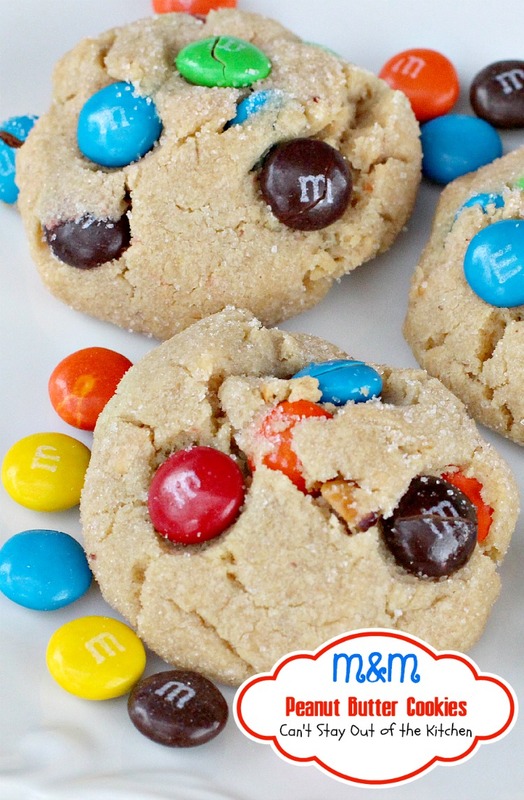 M&M Peanut Butter Cookies are the best of both worlds! 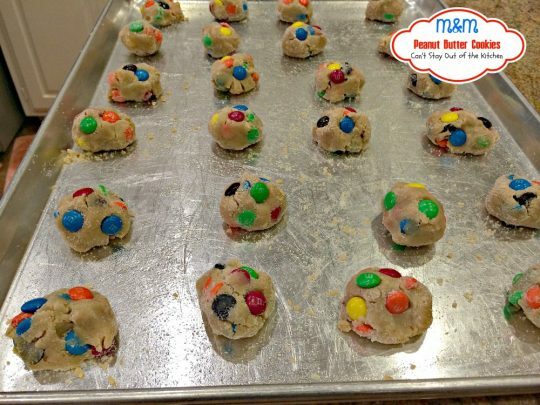 Delightful Peanut Butter Cookies are filled with M&M's for a scrumptious taste that will have you coming back for more. Set aside 1/3 cup M&M’s to decorate the tops of the cookies. 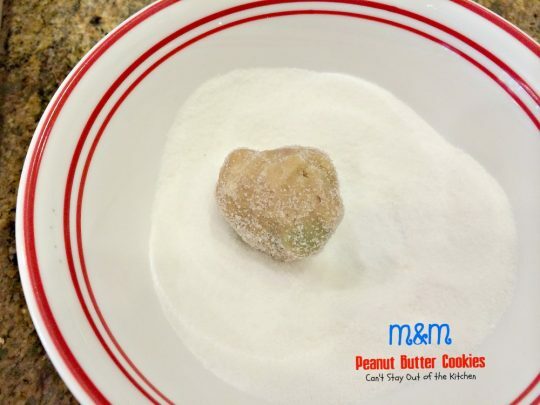 Mix thoroughly the coconut oil, butter, peanut butter, sugar, brown sugar, egg, baking soda, baking powder and salt. Add flour and M&M’s and stir to combine. (You cannot omit this step). Top with 3-4 M&M’s on each cookie. Bake 15-20 minutes or until set but not hard. NOTE: Time required to chill dough is not shown in preparation time. M&M Peanut Butter Cookies are the best of both worlds! 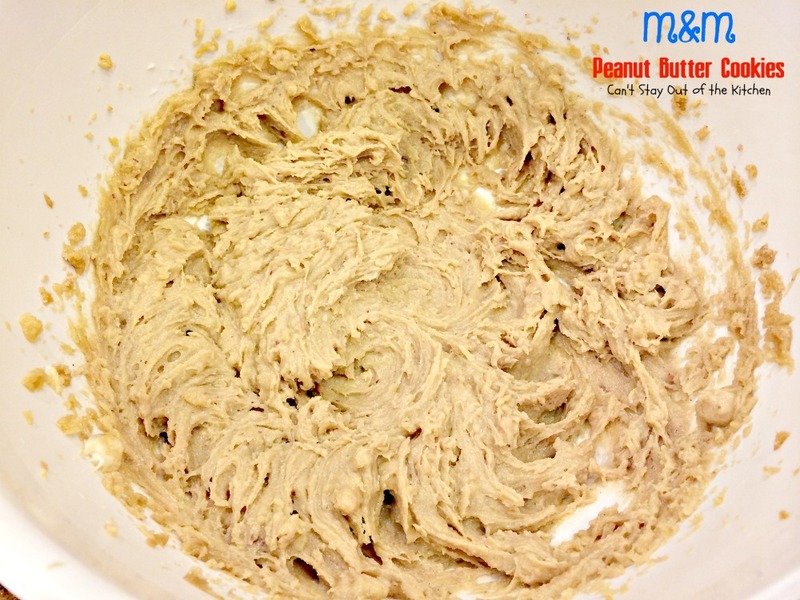 Delightful [url href=”http://cantstayoutofthekitchen.com/2012/06/14/peanut-butter-cookies/” target=”_blank” title=”peanut butter cookies”]Peanut Butter Cookies[/url] are filled with [url href=”http://www.mms.com/” target=”_blank” title=”M&M’s”]M&M’s[/url] for a scrumptious taste that will have you coming back for more. Time required to chill dough is not shown in preparation time. 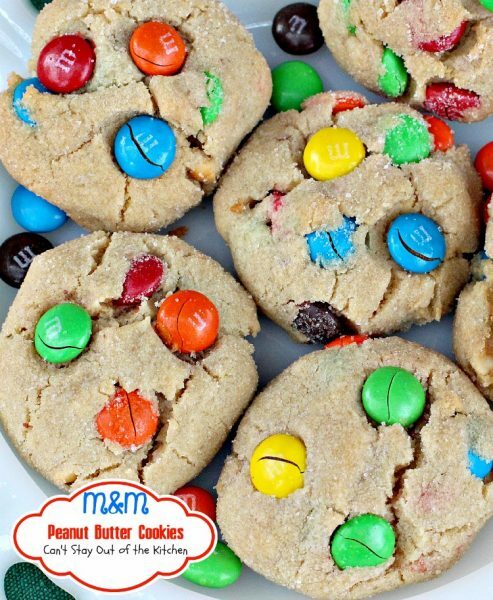 Don’t M&M Peanut Butter Cookies look terrific? Sit down with a glass of milk and enjoy a handful of these lovely cookies. These look so good! I love the combination of peanut butter and chocolate so I know I would love them. We both had M & M’s on the brain this week. I can’t believe you are already done with your cookie baking. That’s so impressive. I still have a ways to go. Thanks for another great recipe! Thanks, Shari, you are so kind. 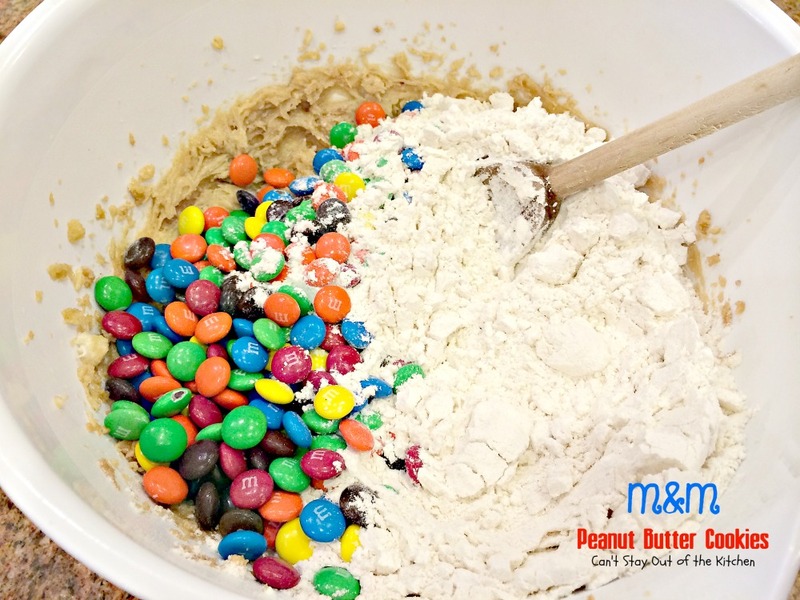 You can never go wrong with M&M’s and peanut butter! Have a wonderful Christmas.